Magnus Carlsen, fresh from claiming another world championship title in Saudi Arabia last weekend, is now gearing up for a new tournament in the Netherlands next weekend. He took some time, however, to respond to criticism against the Saudi event and himself for taking part in it. “There were a lot of positive aspects to having the World Championships (in rapid and blitz chess) here,” Carlsen told Norwegian Broadcasting (NRK) when still in Riyadh during the New Year’s weekend. “I don’t think people should only focus on the negative.” The latter involved the Saudis’ refusal to grant visas to Israeli chess players, for example, along with ongoing international controversy over restrictions on women and human rights violations in the strict Islamic country. Carlsen himself had decided to take part unlike his top female counterpart from Ukraine, who boycotted the tournament because of how women are subjected to strict control in Saudi Arabia. Carlsen had hoped everyone would participate, including the Israelis. The closest he came to criticizing Saudi organizers was over their refusal to grant visas to Israeli players. “I hope that if (the rapid and blitz championships) are arranged here several times, that everyone can participate,” Carlsen told NRK. There’s also been criticism that the international chess federation FIDE has already agreed to hold the championships back in Riyadh both in 2018 and 2019. Norway’s own chess federation is skeptical and considering launching another attempt to organize the major event itself, in Stavanger. Otherwise Carlsen was satisfied, not just with his new trophy and financial winnings (the Saudis quadrupled the size of the total winnings pot, from the USD 480,000 paid out in Qatar in 2016 to USD 2 million this time), but also with the event itself. 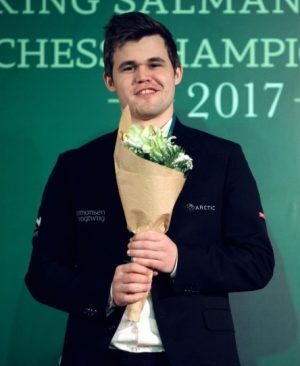 “For me it was mostly about a sports success, but we have had a fine time,” Carlsen said. “The whole family was satisfied.” Carlsen had been joined in Riyadh by both his father (who’s also acted as his manager and chief adviser), his mother and his sisters. Carlsen will be back in action from next Saturday, January 13, at the Tata Steel Chess tournament in Wijk aan Zee, the Netherlands.